Build your custom dream home at Sherwood Golf & Country Club Estates. It could be the perfect place for you. The Golf and Country Club Estates is an affluent community of elegant estate homes. When you drive through the area, you’ll see oversized driveways, large lots, and stunning architecture. It’s a quiet oasis on the south side of Sherwood Park with the benefits of rural living–minutes from the city. Who wants to spend time commuting? 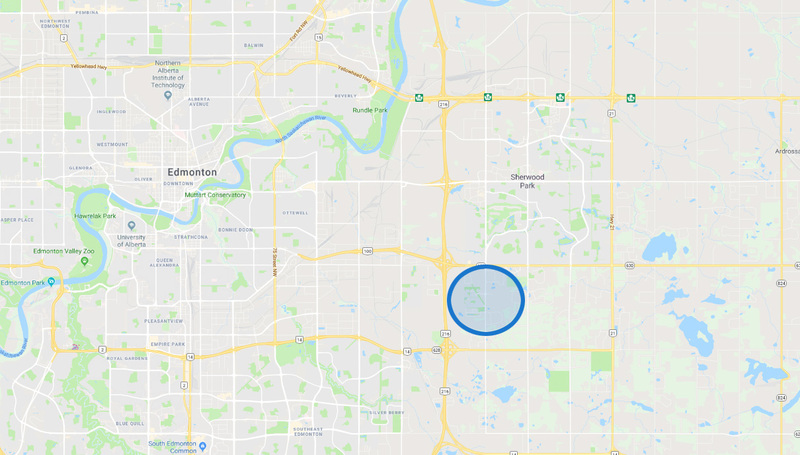 The Sherwood Park Golf and Country Club Estates has quick access to Edmonton via the Whitemud, Anthony Henday, or Yellowhead. Getting around The Park is a breeze from this location as well. Just about everything you need is a few minutes’ drive away! If you like to shop, you’re in luck. You’ll find major outlet stores in The Sherwood Park Mall, Emerald Hills Shopping Centre, and the Baseline Village Mall. You’ll find more shops scattered around the park. Here’s a list of Sherwood Park’s Boutiques. If you enjoy frequenting farmers’ markets, there are a couple that run year-round. Click here for details about farmers’ markets. You’re never far from a park in Sherwood Park. Golf and Country Club Estates is very close to the dog park and the pirate ship playground and spray park is just a few minutes away. There are approximately 80 parks scattered around The Park. See the full list here. Take a look at the Sherwood Park Recreation Guide for even more ways to keep your mind and body active. Proximity to schools is important when you have a family. Sherwood Park’s Golf and Country Club Estates is close to public, catholic, and French immersion schools. Westboro and Pine Street Elementary are the public school options. Children then go on to Sherwood Heights Junior High and Salisbury Composite High School. Catholic students can attend Madonna Catholic School from kindergarten to Grade 4. Next they’ll attend Grades 5 to 8 at St. Theresa Catholic School and 9-12 at Archbishop Jordan Catholic High School. Click here to see where Sherwood Park offers French Immersion programs. Craving a night out? Sherwood Park has something for whatever flavour you’re in the mood for. Are you a Sushi lover? If so, check out the 5 Best Japanese Restaurants in Sherwood Park. You’re also close to Vietnamese food, Thai food, Chinese food, Indian food, and Canadian favourites like BBQ, pizza, pasta, burger, chicken, and rib places. Pasta Pantry: The people of Sherwood Park are passionate about The Pasta Pantry. Freshly made pasta, robust sauces, and fast, friendly service is what keeps them a community favourite. That Bar-B-Q Place: If you’re in the Millennium Place area, grab some delicious, slow cooked BBQ ribs or brisket from this quaint “Southern Comfort” restaurant. La Patrona: Local owners and very popular with the locals. Authentic food and friendly environment. Freshii: Feel good about going out to eat when you fill up on superfoods at Freshii. You can get juices for your juice cleanse or whole, healthy meals to go. Tutti Fruitti: If you like Cora’s, you’ll love Tutti Fruitti. They make breakfast and brunch an event. Just about every meal comes with elegant fruit bouquets that are both yummy and beautiful. Original Joe’s: Go to Original Joe’s for tasty pub food and a relaxing, friendly atmosphere. Vicky’s Bistro: You’ll find Vicky’s on the Best of Sherwood Park lists over and over because it is one of the best restaurants in the area. They offer a unique atmosphere and Mediterranean cuisine. The owners’ personal attention to the restaurant clientele is what will keep you coming back for years. Earl’s: A long-standing community favourite, Earls is the place to go for family celebrations, a night out with friends, and especially date night. The Most Important Part: Your Custom Built Luxury Home! Custom flooring, lighting, finishes… and more!